Recession? What recession? Apple executives can't be blamed for thinking that the sun rises on Cupertino every day following news that the company has already sold out of its initial shipment of the Apple iPhone 4S. Letdown? What Letdown? The news of the sellout is like Apple sticking its tongue out to all those who felt that the introduction of the Apple iPhone 4S lacked the event's usual "panache" and felt that sales would lag because of the limited improvements made over the current Apple iPhone 4. While many had expected Apple to rollout a totally redesigned Apple iPhone 5 with a larger 4 inch+ screen to match recent Android models, the Apple iPhone 4S looks exactly like the Apple iPhone 4 with some Android-influenced changes. For example, the single-core A4 processor has been replaced by a dual-core A5. The 5MP camera is gone, replaced by an 8MP shooter and the iPhone 4S offers the Siri Voice Recognition system which expands upon the current Voice Recognition system found on Android. AT&T late Friday reported a record pre-order of 200,000 units, and Sprint's web site says that the carrier has sold out of the 16GB model. As of Saturday morning, the web site still shows the 32GB and 64GB models available for pre-order at the nation's third largest carrier, while the 16GB model will still be in stores on October 14th. 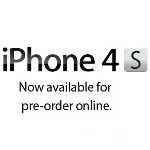 At Verizon, the 16GB version of the Apple iPhone 4S in black or white now shows a delivery date of October 21st, one week after the launch date. All other models show a delivery date of October 14th. With all this demand, Wall Street analysts now expect a record breaking launch by the new iteration of Apple's touchscreen phone. more than half have the iphone 4 i bet.....i agree....sheep! So are the people who upgrade to the latest android sheep? exactly Taco. Them Androids come out every month. Exactly. Heck, I'm upgrading to the iphone4S from a Sony Ericsson C905! Curious about what the hubbub is about and it'll be my first Apple product ever. Seems to be a great phone and gives me time to wait until SE fixes their Android lineup. Dude where do I begin...android has ALOT of catching up to do...apple have a pretty much flawless device...if not for the fact tht I damaged my iPhone 4 I won't be buying the 4s cuz the 4 is pretty much flawless. Android needs to work together with phone makers in a way tht their phones become stable, android phones are high end top of the line but they are just not stable like a windows pc...but forget all tht and explain to me how it is any of your business what people do with THEIR money? Why do u take it upon urself to insult iPhone buyers? Does anyone insult people for buying the android? And how can u follow android like a sheep and accuse someone else of being a sheep? I mean did apple offend u personally or did iPhone buyers offend u personally? And how is apple different from any other phone manufacturer, u do realize tht their all in it to make a profit. Do u think android phone makers would hesitate to sell "the same phone" every year if they knew they had a market for it? Bottom line...android phones will come and go but The iPhone is 4eva! Deal with it! Hahahahahaha its spelled joke not joak that's what you are. Its pretty obvious English isn't your first language. You don't know anything about phones. I guess all perfect phones don't need a good antenna.I'm gonna guess you don't need anyone else to talk to since you're probably having quite a conversation with the voices in your head. And there are a bunch of similar issues with Android devices. That is why there is a warranty. 1. When the phone shuts off for "no damn reason", you push and hold the home button and lock button until you see the Apple logo. 2. Right when activated? It may be Verizons system thats flawed at that point. Or the system needs to refresh with the new equipment information. OTA activations are troublesome, especially with Verizon 4G devices. Which, I know the iPhone isn't 4G. I was just using it as an example for OTA activations. @habib. So the iphone turns off by itself and users can't hear the other person on the other end when on a call? Is that why the iphone4 has the highest customer satisfaction? Hahahaha. Nice try Mr Liar. I worked for Apple, and must say, I have never heard of either of those problems happening, and seriously doubt the frequency of them occurring. That's absurd. No product is perfect. But that's a joke. Why would you say that android isn't stable ? What features does android lack compare to iphone? how about Siri, thats about it. maybe you need an iphone to help you with the difference between "sleep" and "sheep" (which could be a typo, and "your" and "you're" which is like 3rd grade english. Just remember where most of "Damn You Auto Correct! "'s entries come from. I think there a lot of idiots ordering this phone cause jobs passed away. Just my opinion. Lol I like the iPhone, I can't disagree, there is something about it what makes you want to get it. I don't know what. But I'll stick with my Windows Phone for now. android is good , actually my phone right now is an android ( SGII ) but i don't know why once you start downloading apps it becomes a little sluggish at times or an app is working fine and after an update it doesn't , the screen in the iphone is really small though, at least for me but overall it works flawless.